Within the last four years container technologies have become very popular. A lot of companies and developers are now using containers to ship their applications. Docker provides an easy-to-use packaging model to bundle the application. However in many cases, a single container is not enough to run an application. It requires multiple containers, scaled into multiple host machines to become a production grade deployment. Kubernetes is an open source system for automating deployment, scaling, and management of containerized applications. It groups containers that make up an application into logical units for easy management and discovery. 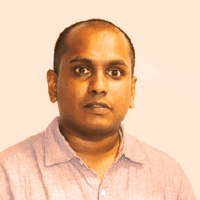 In this session, Lakmal will discuss best practices of deploying application in Docker and Kubernetes while discussing Docker and Kubernetes concepts. Lakmal Warusawithana is the Senior Director – Cloud Architecture of WSO2. Lakmal has a long history of working in open source, cloud, and DevOps technologies and has been Vice President of Apache Stratos PaaS Project. Lakmal is the core architect and key contributor for containerization and deployment orchestration of Ballerina, cloud native programing language. Lakmal has also presented at numerous events, including ApacheCon, CloudOpen, QCon, JaxLondon, Cloud Expo, Cloudstack Collaboration Conference, WSO2Con, and many tech meetups.